Doctors recommend introducing solid food to babies after they turn 4 or 6 months old. The food has to be soft, easily digestible, tasty and mildly flavoured. The sooner we introduce solid food to babies, the more it will become easier for babies to shift from milk to solid food thereby making them more healthy and increasing their immunity. 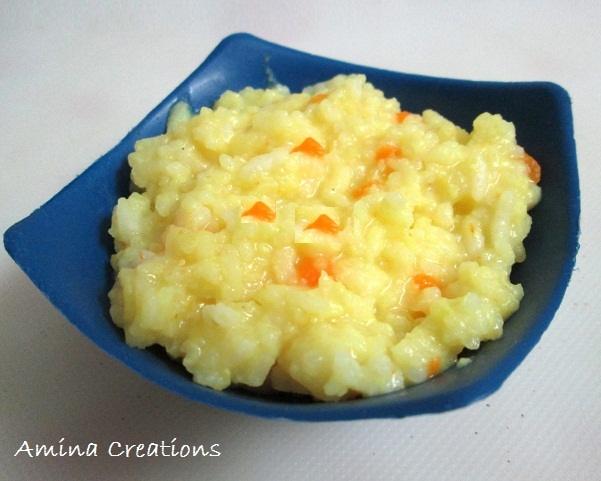 Here I am sharing 5 recipes of baby food that I gave to my daughter when she was a toddler. These baby friendly recipes are easy to make, easy to swallow and digestible for babies. 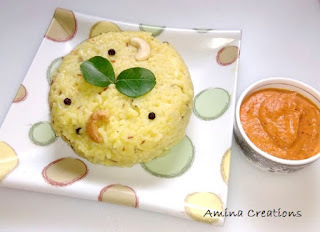 I started giving this khichdi to my baby after she turned 6 months old. It is nutritious and easy to make. Heat ghee in a pressure cooker, add onions and saute till they turn soft. Now add red chilli powder, turmeric powder, carrots and salt to taste and mix well. Add rice and moong dal and mix well. Mash it after opening the lid. 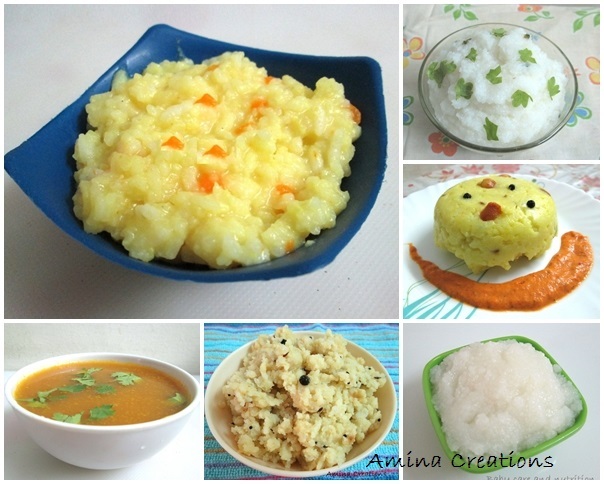 If you are going to feed this khichdi to a baby who is over one year, then there is no need to mash it. 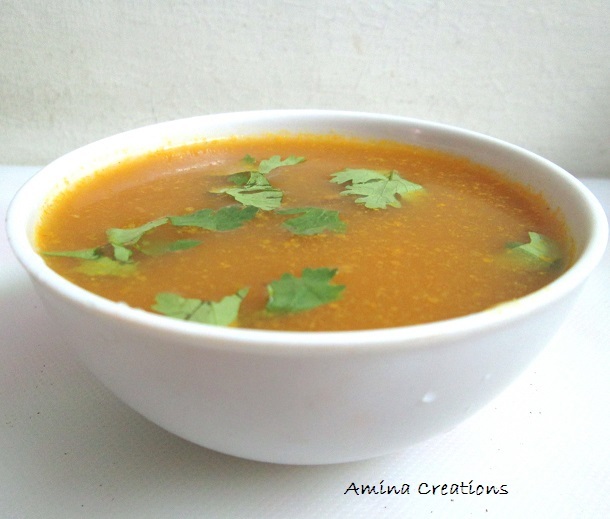 This is a healthy and delicious soup which is very good for your baby's joints and it also helps in bone development. Take a pressure cooker, add onions, garlic cloves, red chilli powder, coiander powder, turmeric powder, salt, tomato puree, mutton pieces, coriander leaves and water. Close the lid and pressure cook for 4 to 5 whistles. Mix with rice and feed your baby. Alternately you can also strain with a strainer and feed you baby as a soup. This simple recipe is specially meant for babies who are less than a year old. It requires very few ingredients and gets cooked really fast. A perfect dish to turn to when your baby is hungry and you do not have much time. Take water and salt in a pan and bring to a boil. When it starts boiling add semolina and stir well such that there are no lumps. Continue cooking and stirring for a few minutes till most of the water has evaporated and large bubbles are seen. Now reduce the heat to low, close a lid and let it cook for a couple of minutes. 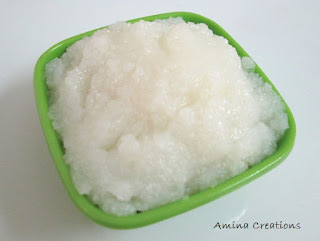 Check if the semolina is well cooked and soft. 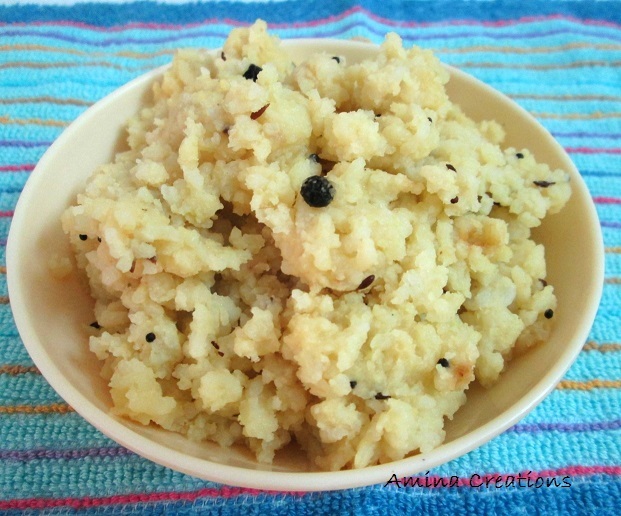 When you wish to cook a quick and different meal for your baby then this sweet upma would be your perfect choice. This upma is mildly sweet and I have added cashew nut powder to it, to make it more healthy and flavourful. Take water and sugar in a pan and bring to a boil. Add cashew nut powder and continue cooking and stirring for a few minutes till most of the water has evaporated and large bubbles are seen. Switch off the gas, allow it to cool and serve warm to your baby. Rice Pongal is a healthy and filling breakfast for babies who are more than one year old. Here I have added a few peppercorns for flavour as babies have to start getting used to peppers in small quantities. But these peppercorns along with curry leaves and cumin seeds (also added) have to be removed while feeding your baby. Wash and soak the rice and moong dal in water for at least half an hour. Heat ghee in a pressure cooker, add black pepper corns, cumin seeds and saute for a few seconds. Nest add curry leaves, turmeric powder and salt and mix well. Drain the water and add the rice and moong dal to the pressure cooker and stir for a few seconds. Add water and close the lid of the cooker. Pressure cook for 3 to 4 whistles and switch off the gas. Allow the steam to escape and open the lid. 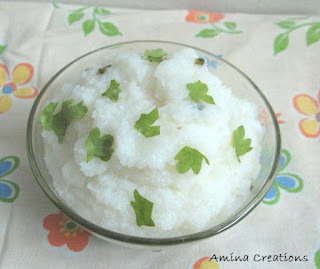 Transfer the pongal to a bowl and wait till it cools down a bit. If you are feeding a baby who is less than a year old, you can omit the peppercorns, cumin seeds and curry leaves and make the pongal following the same recipe. Pongal is a great breakfast dish for babies. This recipe of pongal is ideal for kids who are over 20 months. I started giving this pongal to my baby when she was 1 and half year old and she instantly liked it. Remember to take away the peppercorns and curry leaves while feeding your baby and ask them to chew each bite well as we have added cashews. We need to introduce coarse food to babies at this stage, hence do not ground the cashews to a powder. Soak pongal rice and moong dal in water for about half an hour. Drain the water from them and keep ready. Heat ghee in a pressure cooker, add cumin seeds, peppercorns and curry leaves and sauté for a few seconds. Add cashews and turmeric powder and saute till the cashews turn golden. Add 6 and half cups water, rice, dal and salt and mix well. Close the lid and pressure cook for 4 whistles. Switch off the gas and wait till the steam has come out. Open the lid of the cooker and add a few tsps of ghee on top and serve hot with tomato chutney and sambar. If your kid does not like spicy sambar, you can dilute your sambar with water while feeding your baby.